CANADA – Were you unable to attend LCC’s Convention in Vancouver? Trying to catch up on important news from the convention? The easiest way to find out what you missed is by viewing the news stories posted online at The Canadian Lutheran. We’ve posted information on the acclamation of President Robert Bugbee to another term, his response to the reelection, the results of vice presidential elections, and elections for other boards, commissions, and committees. We’ve also reported on the presentations of the Convention’s two essayists, Rev. Kurt Reinhardt and Deacon Jennifer Shack, as well as greetings from LCC Presidents Emeriti and international guests. 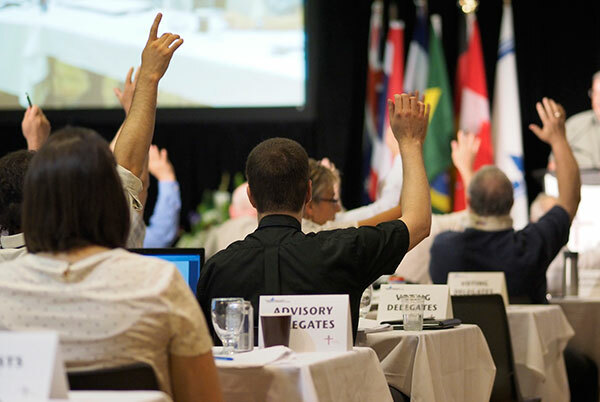 Finally, we’ve highlighted some of resolutions adopted by the convention, including naming the Lutheran Laymens League of Canada as an official LCC auxiliary, praying for families of those affected in the recent Moncton shooting, and providing for diaconal service on synodical boards, commissions, and committees. You can catch up on another news by reading the Daily Newsletters published throughout the Convention. Need more details than that? See the minutes of the convention (including all the resolutions adopted in their final amended forms) in the Today’s Business releases. You can also catch up on video from the convention by visiting http://synod2014.lutheranchurch.ca/convention-session-videos-online/. This website includes full video of every session of the convention as originally broadcast online, including devotions, greetings, votes, convention essays, and more. Separate videos (of convention essayists, sermons, and more) will eventually be uploaded to YouTube individually at a later date. The above videos do not include the opening worship service. This service will be uploaded to LCC’s YouTube account at a later date.